Launched by Microsoft, Windows Phone Series has introduced unimaginable changes in the way we use our mobile phones. Additionally, it allows you to utilize the advantages of chat, emails, games, and schedules. The best part about Windows Phone app design is that apart from bringing in profits, it can also create brand awareness, thus strengthening customer interaction. 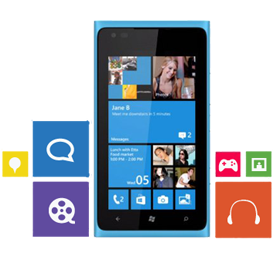 Windows Mobile phone very popular in the marke due to its wide range of user friendly applications, windows mobile applications are liked by millions of mobile phone users. Corporate and businesses are the most active among them. Windows platform is preferred by both technical and non-technical people. We utilize all the advantageous features of Windows platform to deliver the most cost effective & quality mobile application for you. Recognizing the immense potential and user acceptability of Microsoft, we at Gizmeon are committed to take care of the entire development cycle associated with Windows apps. Our expert team of Mobile developers is capable of providing world class apps in Windows platform in accordance with customer expectations. Our differentiating factor includes developing apps in a cost effective and flexible way implemented through Agile methodology. This ensures customer involvement in every stage of app development.